Months ago, I shared the story of a little mystery that is happening along the bike trail that runs behind my neighborhood. If you haven't read it yet, please take a moment to do so here....this story is SO much better with a little background. I have a mysterious friend ( or two) who leaves little rocks on the top of a post for others to find. Its been going on for months. But this week it became much more fun! It started small. A few rocks piled on the post. I and others would add to the pile. They would disappear for a while and then re-appear, bringing me more joy than seems reasonable. Somehow this little ritual makes me feel connected to my neighbors and I look forward to it everyday. Lately it has been growing. Someone clever thought to use a very large rock as the foundation for our pile and it stayed for weeks, gradually getting bigger. Everyday, my mystery friend would rearrange the rocks in little patterns. Sometimes he or she added little flowers or leaves- everyday bringing something new! No one dared mess with it for a long time (strong foundations have a way of doing that) and it grew quite large before someone knocked it down ( this part of the mystery I have worked out.... to the person who is spoiling our fun...I am ON to you!) and scattered it about. Never one to let the fun end, I added a new rock to the post and on we went building our rock tower again. A PAINTBRUSH! My mystery friend left a paintbrush! FOR ME...all wrapped up in pretty fall leaves... so much joy! Of course I now have all sorts of theories as to who is leaving me such treasures. So far no one will fess up. 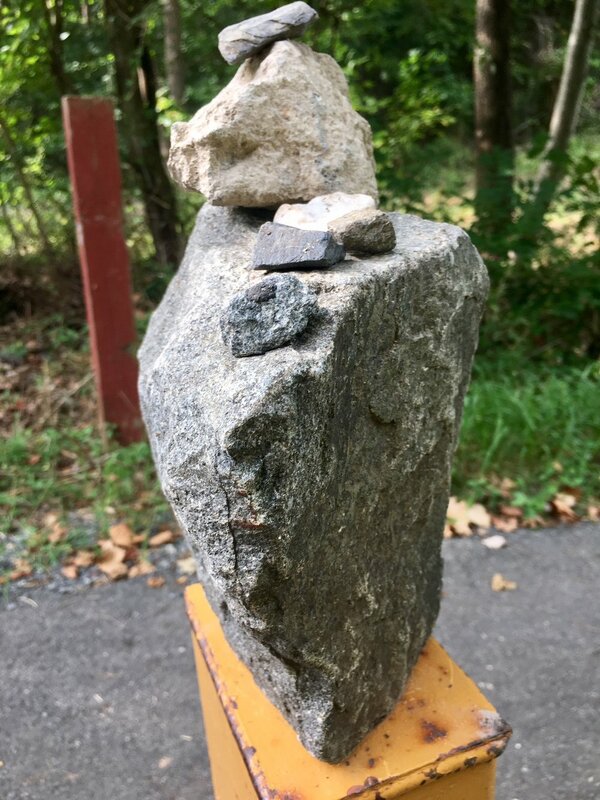 I do recognize that it is possible this was a gift for another artist who also piles rocks on our pile....but I'm pretending it was just for me...oh, the beauty of mystery! To my thoughtful and mysterious friend....Thank you for playing this game with me... I don't know who you are but please know I adore your appreciation of whimsy and surprises. If you are reading this.... you make me smile every day and I am most grateful. Stay tuned for updates or better yet...start your own little mystery today!